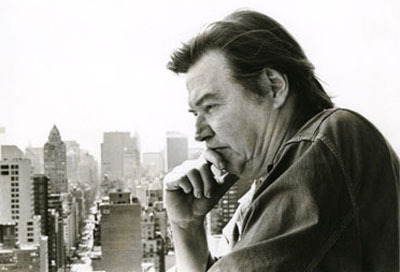 Tom Jobim at his apartment in New York, 1987. Photo by Ana Lontra Jobim. Tom with Ana Lontra Jobim in 1979, recording the LP Terra Brasilis at RCA Studios in New York. 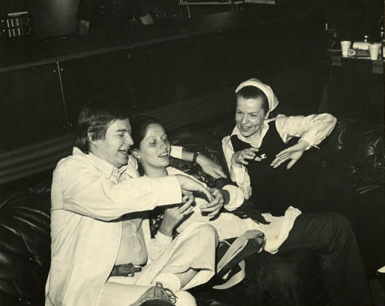 Tom Jobim began this song in Hotel Adams in New York, where he was on honeymoon in 1978 with his second wife, Ana Lontra Jobim. He dedicated the song to Ana, whom he had met two years earlier in 1976, when she was nineteen years old. Ana spent the final seventeen years of Tom’s life with him, and they had two children together, João Franciso (1979-1998) and Maria Luiza (born 1987). Ana recalls that Tom enthusiastically declared Maria Luiza an “artistic genius” shortly after her birth; he forbade Ana from enrolling her in any art programs lest they corrupt her talent. João Fransisco died tragically at eighteen, when he crashed the car he’d been given two weeks earlier as a graduation present from Ana. 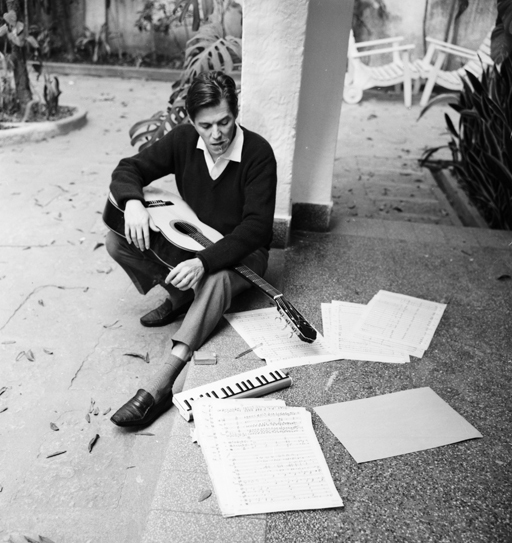 Tom composing at his home on Rua Barão da Torre in Ipanema, in the 1960s. Luiz Roberto Oliveira claims a small role in these lyrics, recounting that he visited Tom at his mother Nilza Jobim’s home in Leblon in 1978 and found Tom struggling to finalize the lyrics to this song. Tom wasn’t happy with the line “chora flauta, chora pinho” (above: “cry flute, cry pine” — pine is used in portuguese as slang for guitar), in part because he thought chora pinho sounded like one word – chorapinho. But Oliveira recalls telling Tom that the line sounded fine, and so Tom left it as it was. In the first clip above, Tom presents Falando de amor to his longtime partner Chico Buarque as a potential song for Chico to record, describing it as “that kind of Brazilian song that cries and laughs, laughs and cries.” (To read about the friendship and partnership between Tom and Chico, you can see the posts for Retrato em branco e preto – the first song they composed together, Sabiá and Piano na Mangueira.) The song is a choro canção (alternatively known as samba-choro) in the same genre as Pixinguinha’s “Carinhoso.” Choro means “cry” in Portuguese, and Tom played around with that in the lyrics: “Cry, flute; cry, pine; I, your singer, cry/ Cry gently, so quietly, in this choro speaking of love.” Tom recorded Falando de amor for his album Terra Brasilis, released in 1980. Main source for this post: Tom Jobim: Histórias de Canções by Wagner Homem and Luiz Roberto Oliveira.